A combined group of 15 started out nice and easy, heading down RSF road with just a tiny bit of uphill on this mostly downhill warm up stretch. We met up with C group leader, Michell, whom the San Diego Transit Authority had decidedly let down – a 40 minute bus delay prevented her from making it to the start point on time. 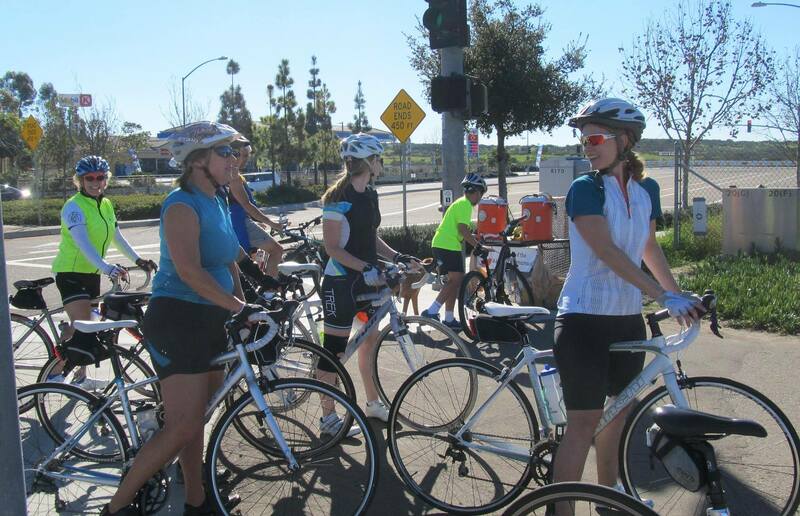 So we met up at the Encinitas/RSF crossroads right before heading out on our first uphill jaunt into Rancho Santa Fe. Michell had it easy laying in wait this time. We were easy targets! 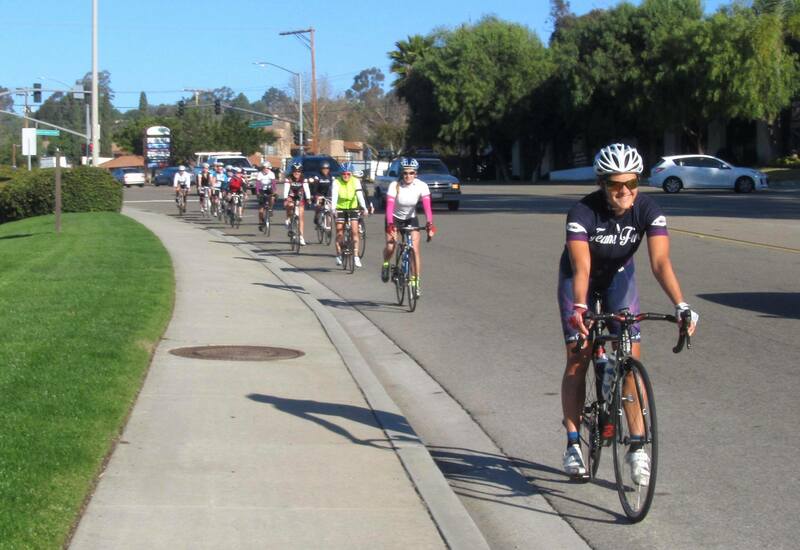 All groups started on the same route through Rancho Santa Fe. La Bajada is not my favorite entrance point into RSF, but it’s the most direct for where we wanted to go (and believe it or not, is the shortest climb). The six in the A/B group split off from the C group at this point, although we were all in a mode of saving up some energy for the future. We were off La Bajada in no time, and onto one of my favorite roads in RSF, Rambla De Las Flores. Shaded for most of the way, this awesome lane runs by soccer fields, horse jumping arenas, and houses with lush gardens. It’s a little less awesome near the end where the grade goes from acceptable to whoa! (~13%), but I figured our legs needed a little wakening up on the way out. We kept on our beeline toward San Dieguito Road, and headed straight down Calzada Del Bosque and across to Via de Santa Fe, approaching the Three Witches climb. 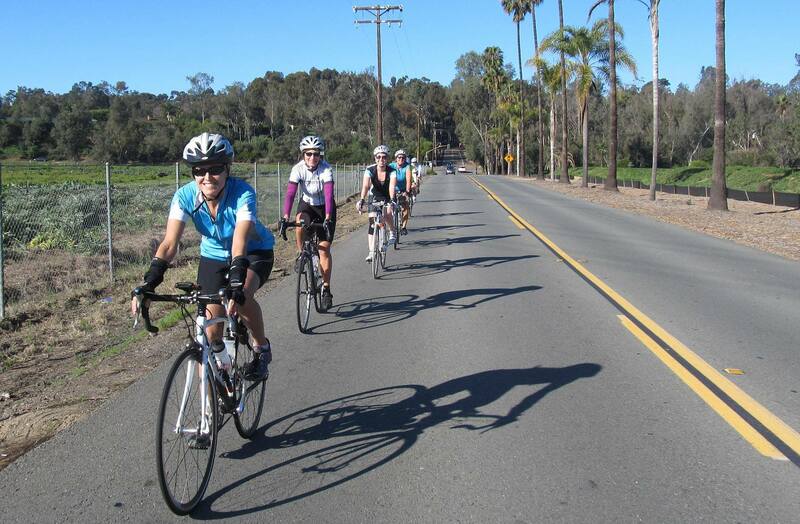 Who says there’s no flat road in Rancho Santa Fe? Calzada del Bosque is… well, much of it, anyhow. So I’ll take this side of the story, and I’m going to stop calling it A/B group when really, for everything this group climbed this past Saturday, it was definitely “A Group worthy” (whatever that means!). A men’s group turned onto San Dieguito Road just ahead of us, and as I watched the pace, I tried to pretty well match it. As we continued to climb, there started to be a few stragglers, so I got it into my head that my goal was to catch and pass at least one of them (I get these things into my head – I’m supposed to not listen to them, but they are very insistent). Lauran decided to tag along, and we did in fact accomplish our goal (and maybe even caught more than one), with Lauran speeding off on the third witch with incredible stamina. We regrouped at the top, and our next goal was to be to find a restroom for poor Lauran, who’d been wanting one since Rambla De Las Flores. If anyone’s been on a long drive with me, I’m pretty much the same on a bike ride – let’s see how long we can hold out (I’m awful). So, pretty much by the time we found a bathroom at a coffee shop in Rancho Bernardo, the whole group was ready to use it. Efficiency! The next part of the ride was a little respite before the intense end. We meandered down a side street of Rancho Bernardo, and then headed around the Rancho Bernardo Community Park toward the Lake Hodges bridge (and I use the term “Lake” loosely). A nice runner stopped to snap a few shots for us – it’s a great spot for a photo (or a long sit to watch for hawks, but a long sit was not in our cards today!). We came across the bridge and under I-15 over to Escondido, where we began a series of gradual climbs out toward Del Dios/Elfin Forest. Of particular interest was the Gamble Lane “wall”, with gradients near 19% in parts. I originally had us going around this wall, but I knew this group could handle it (and they sure did). Coming out on the other side of I-15 toward Via Rancho Parkway. Instead of returning for a shorter trip via Elfin Forest or Del Dios, I opted to route us around that area, via Kuana Loa to Country Club (around the construction), and over toward La Moree – which is really just an extra little loop of hill fun, completely unnecessary in a routing sense, but it’s more relaxing than feeling tense on Barham with cars whizzing past. You get the added bonus of previewing Coronado Hills to Mt. Whitney climb – a true beast. It’s intimidating just to look at it! 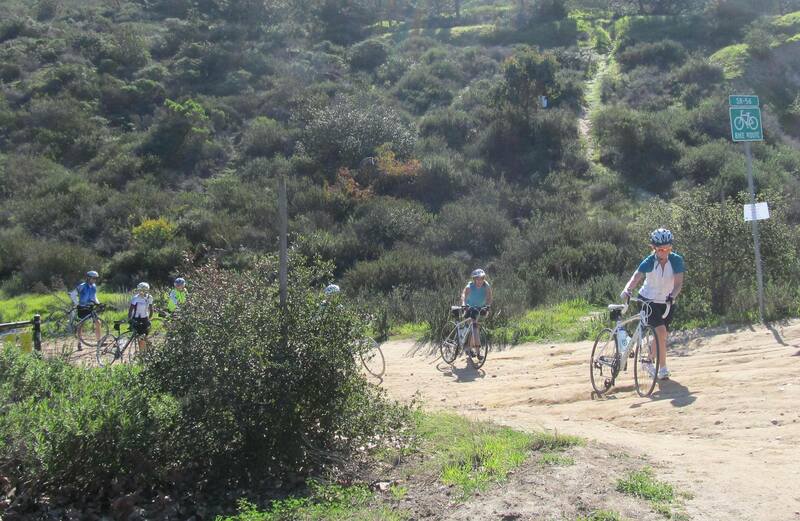 From La Moree, we continued up through a new back road through the CSUSM campus and out to the base of Twin Oaks. Somewhere on the CSUSM campus, we discussed the battle plan for the remainder of the ride… to do Double Peak, or not to do Double Peak, that is the question! We went for it, no doubt! About 3/4 of the way up Twin Oaks, completely drenched in sweat, I said to Lauran, “Maybe I really don’t want to do Double Peak.” And then as I turned onto Double Peak Park Road, I said, “I’m not sure if I’m building fitness or tearing myself down – it’s a fine line.” And I continued on in this, “I really don’t want to do this attitude” pretty much until the top, where all of a sudden, as is almost always the case, the elation of having completed the task wins out. I was so glad we decided to do it – for Vivienne, it was her first time, and for Janice, it was only her second. 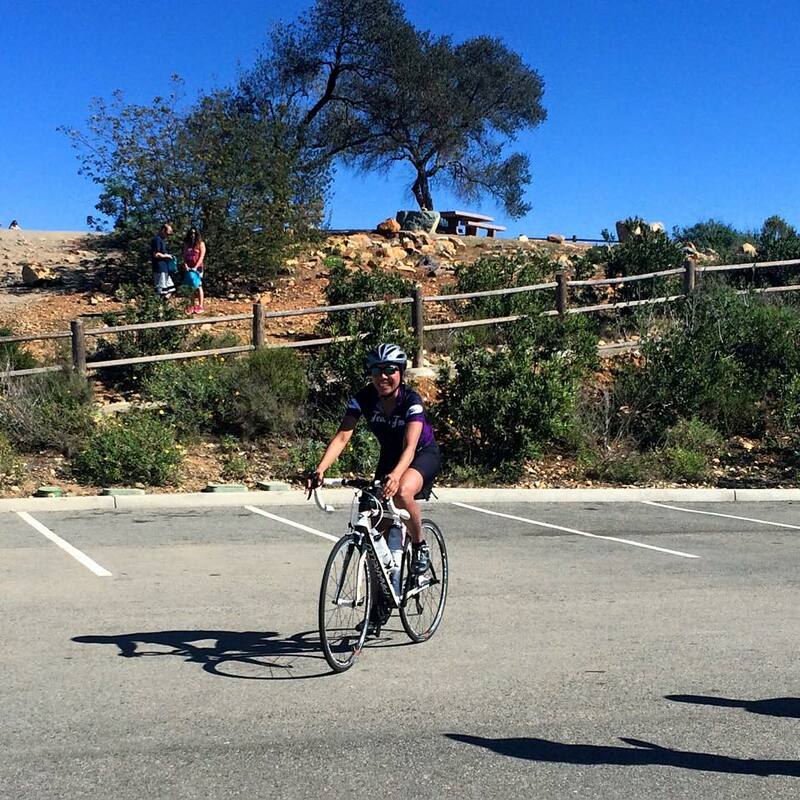 To finish Twin Oaks to Double Peak near the end of a 40+ mile, 4,000+ft ride is definitely an accomplishment! 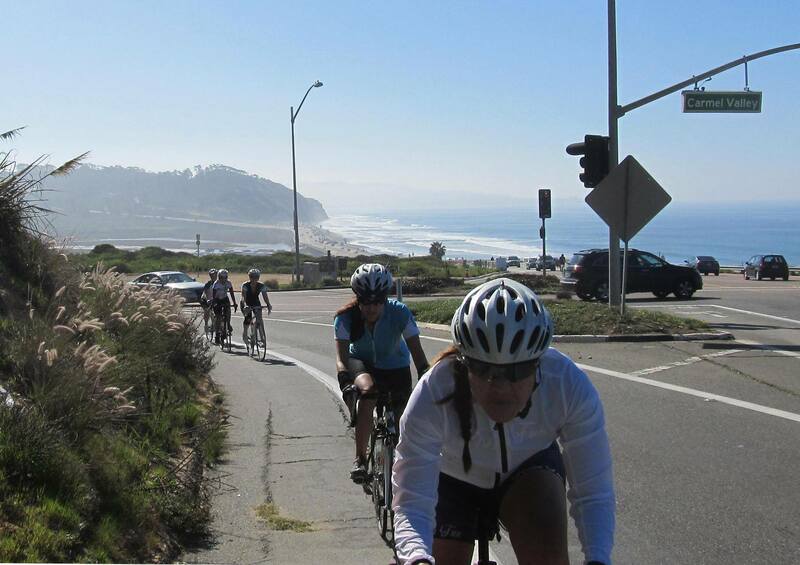 It is amazing that Janice only started riding this past June. Jill took some fine shots at the top to celebrate the ride. C group was quite large at 10 gals, though I was lucky that Kim N was there and rode sweep for me. That really was very helpful since one of the lasses’ knee acted up halfway up Rambla de las Flores and she and her mate had to stop. I was checking my helmet mirror regularly and when we went a few curves without the three last gals I deposited the rest of the group on some really posh driveway and went back to see (ya’ never know, someone could be having a mechanical problem. This is C group after all), and found Lydia literally in tears with her pal Sara and Kim (so they hopefully didn’t feel too abandoned!). Thanks, Kim! Sara & Lydia turned around and went back on their own as Kim and I rejoined the group. We had a really tough and sporting C group! Laura A got a bit entangled with a bee on Via de Santa Fe, but somehow escaped without a scratch. We made it up Three Witches without big gap opening! Then someone suggested we added a few more miles by heading south to the SR56 path and take the coastal route back north. Everyone was game for it and kept the pace really nicely. 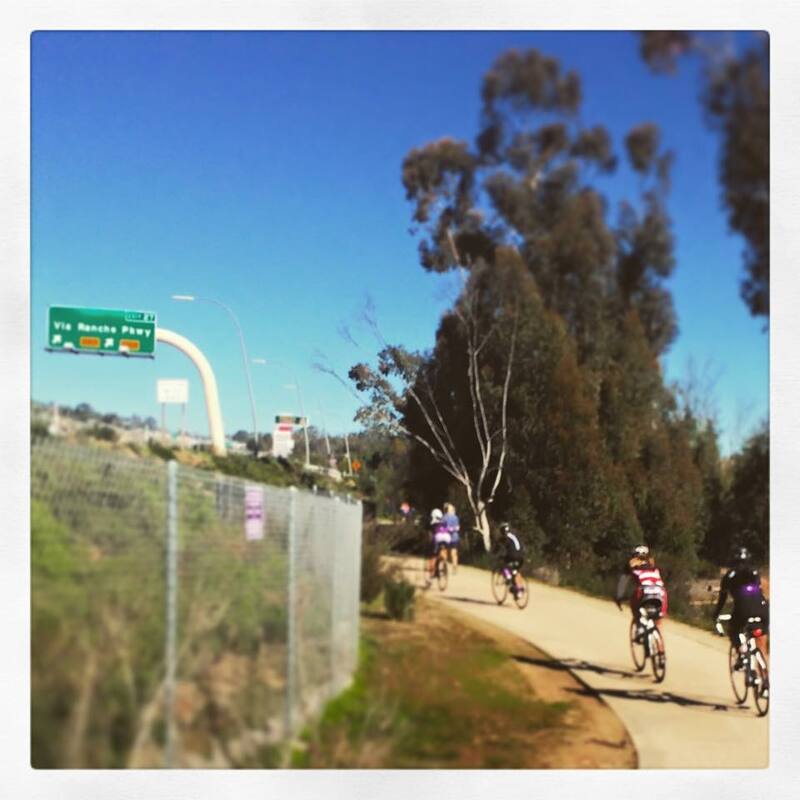 Of course, being a mean gal I made us get off on the rutted dirt ramp to northbound El Camino Real (because… who can resist taking nice road bikes on a little rutted dirt climb??? ). 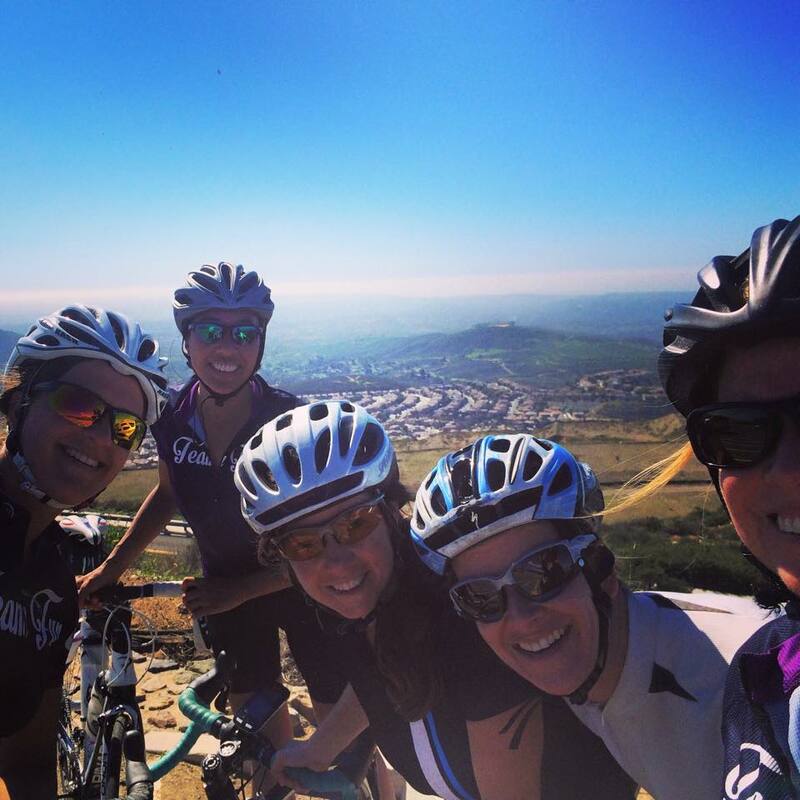 Kim N’s knee was still tender, so she split for home in Solana Beach. Then when we turned inland on Chesterfield Dr (Cardiff) Julie B and Zulma also split to go home, so we were down to 5 riders… quite something out of Agatha Christie’s novel. By the time we got to Rancho Santa Fe Rd again everyone knew which way to go, so I dropped back under the pretense of sweeping instead (in fact I was just wheelsucking… It’s my century riding MO! ). We made it all the way back without losing any more rider, and even get to welcome A/B group, which rolled in just a short while later (and they went on a lot longer ride that included climbing Twin Oaks Valley Rd and Double Peak in their home stretch!). It was a happy reunion worth celebrating with a good shot of post- (or, rather, mid-) ride caffeine at Starbuck’s (’cause that’s the only coffeehouse in the complex). I was my usual glutton self by the time we got to the SR56 bike path, and made us pit stop at Anywhere Bicycle Repair’s pitstop. Heading west on SR56 path. — with Brielle Wacker and Jennifer Rodgers-Wolgast. Look what mean Smorg subjected my charges to!!! (When in the world will they pave this ramp to northbound ECR???). Kim N could see my camera coming from a mile away! 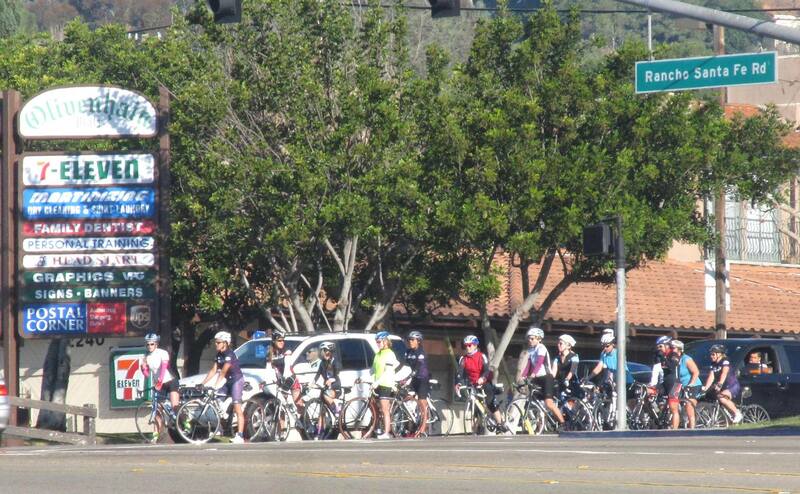 Making the turn onto Camino Del Mar from Carmel Valley Rd. We like to finish our rides with a little treat, I mean, who doesn’t? Our home base for the day was the new shopping center at La Costa Town Center, so we enjoyed a post-ride Starbucks. 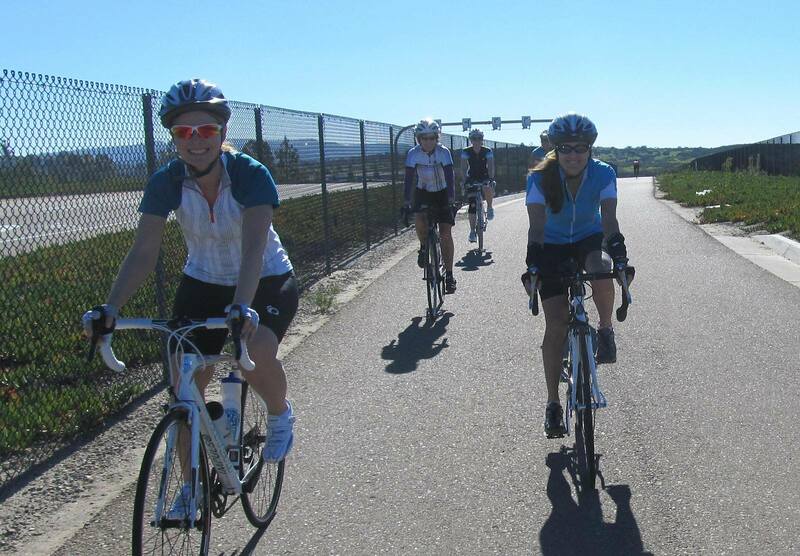 Sometime soon I’d love to finish our rides with a non-coffee treat such as beer tasting at Culture Brewing in Solana Beach, or wine tasting in Temecula. Stay tuned!